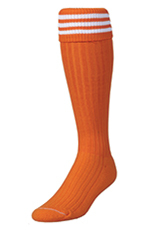 Additional discount pricing for larger quantity orders, soccer socks, soccer shorts and reversible jerseys. Contact us for this quantity discount pricing. A custom made soccer short that is made from the same double layer polyester or nylon mini mesh fabric that is used for our reversible soccer jerseys. Non-reversible, but an ideal color match. For example if your reversible jersey is royal mini mesh reversing to gold mini mesh we can make this in royal mini mesh outer fabric color with a gold mini mesh inner lining. 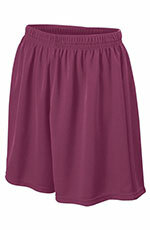 Shorts have elastic waist with inside drawcord. 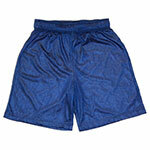 Shorts include 6" adult inseam with approx. 4.5" youth inseam. Made in USA. Made of 100% polyester dazzle fabric. Includes elastic waist with inside drawstring. Adult has 6 inch inseam and youth has 4.5" inseam. Custom made in USA. 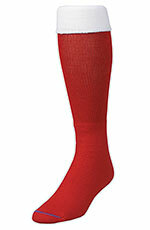 100% polyester wicking knit fabric; covered elastic waistband with inside drawcord; contrasting color piping; adult has 6-inch inseam length, youth graded inseam; Double-needle hemmed bottom. 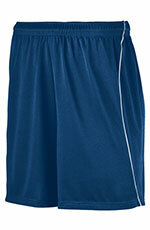 Made of 100% polyester wicking mesh fabric. Covered elastic waistband with inside drawcord. Adult has 6-inch inseam length, youth graded inseam. Double-needle hemmed bottom. Team Price (10-35) Youth $11.50, Adult $12.50; 2XL $13.50. Some of the above links will take you to our other web sites. They should open in a separate browser window. 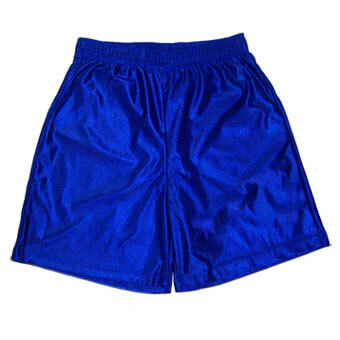 Sizes for shorts are youth extra small through adult extra extra large. Please contact us for league quantity pricing and available delivery dates by email or phone. Note: If this email link does not work on your computer for sending an email, then copy this email address and use it in your email sending system, for example Yahoo or Outlook. © 2007-2017 Dynamo Athletic - All rights reserved.